Welcome back to the Vibe MedSpas blog! In part one, we began exploring the many reasons why you should try microblading to achieve fuller, shapelier eyebrows. Not only is this procedure relatively painless, there is very little downtime after undergoing your microblading procedure, and you can finally get the natural-looking brows you have longed for. Today, let’s look at a few more reasons why you should consider having your eyebrows microbladed. 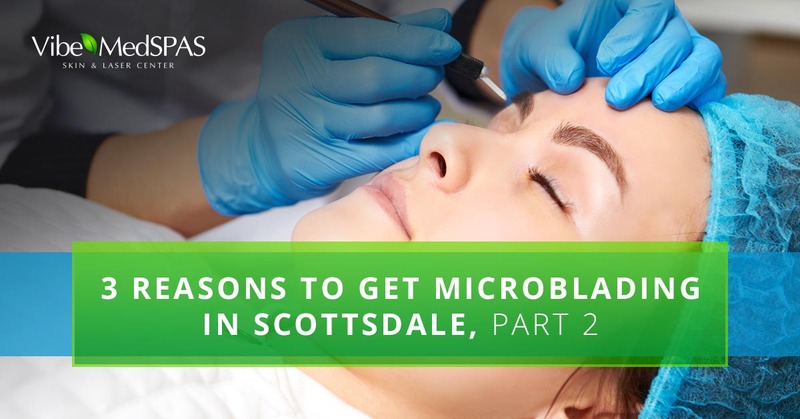 Then, once you are ready to arrange a consultation with a microblading artist, give our Top Rated Local® med spa in Scottsdale a call to begin your journey to achieving flawless, natural-looking eyebrows. There Are So Many Reasons to Try Microblading! When you have full eyebrows that have a gorgeous, natural-looking shape, it can even out the symmetry, shape, and balance of your face. The semi-permanent pigments are applied to your natural brow line, creating a natural shape, length, and size that can enhance your other facial features, enhancing your natural beauty. One of the best reasons to get your eyebrows microbladed is that you will no longer have to spend time and money on dealing with brow pencils, powders, and “long-lasting” brow gels. For one, these never look as a natural as real brows or eyebrow pigments used in microblading, and two, they cost a fortune! Even if you use affordable pencils, purchasing one Rimmel London® eyebrow pencil costs between four and six dollars a pop. Multiply that by a weekly purchase and you’ll end up spending anywhere between $200-$300 each year on eyebrow pencils, not to mention the time you spend trying to perfectly apply your brows once or twice a day. Have you ever accidentally touched your penciled-in eyebrow while at work, only to look in the mirror later on and realize your eyebrows look like Vanilla Ice’s from the 90s? How embarrassing! Semi-permanent brow applications won’t smear or smudge when touched or rubbed, so there’s no need to worry about losing part of your eyebrow. Are you ready to get the fuller, gorgeous brows you desire? Then give Vibe MedSpas a call to book your appointment! Our microblading artists can expertly apply natural-looking pigments to give you the brows you want and deserve. Contact our Top Rated Local® med spa in Scottsdale today! If these reasons haven’t convinced you to have your eyebrows done, tune in for part three!